The very first time I saw the vase I was hooked. I like the black, raw structure on it. Not immediately making me think of lava, but that what it was called when I saw it in the store. The shape is a classic one and I don’t really have a lot of vases in possession so there is plenty of space to add this one. A basic for one that loves flowers. 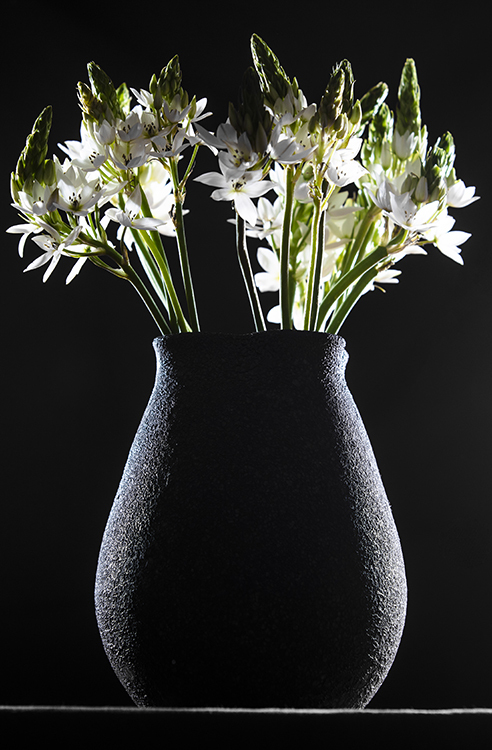 I admit that I always have a preference for white flowers and in this vase I don’t really like any other colors. Red could do, but I am not much of a fan for the color red in general. So, it are mainly white flowers that I put in it. I found the vase with them flowers a perfect add to the Christmas table. I did however get a dark red tablecloth to get a true Christmas touch and so the whole gives a good contrast with the food, but not being too much. For this photo I decided to light it from the back. I have a project in planning for 2019 which contains flowers so I wanted a certain look. As a result I got these hard edges. I am a fan of that. Not everyone’s cup of tea, I am aware but I did not make this photo for anyone other than myself. Also, this is the almost perfect one. The best one is for the project of course. Keep following and see it at this website in 2019. This vase I randomly found at Loods5. I can’t quite recall if it is by any brand, just that it was the only one that was there. It is in my possession for a while by now. More random vases that I have seen can be found here.